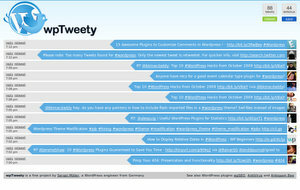 wpTweety is a Twitterwall displaying Tweets about WordPress in realtime. wpTweety is the creation of Sergej Müller. To learn about what is new from wpTweety, simply follow the updates on Twitter @wpSEO.